Serving Colorado's Front Range for the past decade! Vacant lot In University Hills. All the heavy lifting has been done. Asbestos, Demolition, Zone Lot Amendment. 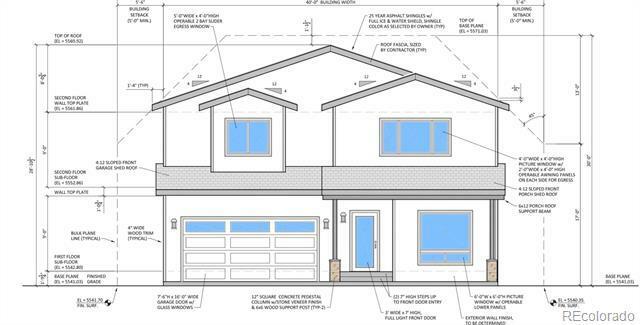 Plans have been submitted and are weeks out from being fully approved for single family home with a total of 4,338 Sq Ft. Home has an attached front loaded 3 car garage and a proven layout!As you enter the home you will see a study, open stair case, and powder room. There is also tons of entertaining space in the family room with open floor plan to the kitchen, tons of cabinet space, dining area, and views to the outdoor patio! This can be anyone's dream home. Please call for plans. Exit prices are estimated in the 1.2 -1.3 million price range. The content relating to real estate for sale in this Web site comes in part from the Internet Data eXchange ("IDX") program of METROLIST, INC.DBA RECOLORADO® Real estate listings held by brokers other than Modern Real Estate are marked with the IDX Logo. This information is being provided for the consumers' personal, non-commercial use and may not be used for any other purpose. All information subject to change and should be independently verified.